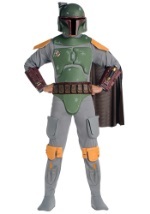 Put your Star Wars collection over the top with this Boba Fett supreme addition costume! 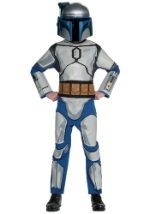 You'll transform into the galaxy's best bounty hunter in this licensed costume. The grey jumpsuit has long sleeves and velcros in the back for closure. Working pockets are located on the thighs and below the knees to keep your ammo in. A light brown shirt is worn over the jumpsuit and is made from foam. A dark green cape is attached to the left shoulder along with Wookie braids. The molded armor pieces are secured in place with durable velcro and have a worn look that include bullet holes. The chest, collar and codpieces are painted green while the shoulder and knee armor are yellow. A brown belt along with an ammo belt wrap around the waist with velcro and brown gauntlets slip on over the wrists. A pair of tubes are attached to the left gauntlet and runs up the arm. 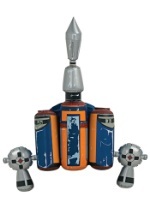 The back piece has an attached jet pack that is made from durable plastic and also has a worn look. The costume is complete with the included helmet that has a t-shaped see-through visor. The helmet is molded for an authentic look and has an attached antenna on the right side. 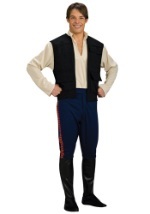 Discover life in a far, far away galaxy with this collector's costume!